Background: Mitochondrial diseases are a complex group of pathologies caused by mutations in genes coded in the nuclear and/or the mitochondrial DNA, which fulfill their function in the organelle. The diagnosis is also complex, since it depends on the integration of biochemical, histological and imaging data. Objective: In this paper we review the use of some of these substances and their efficacy in the treatment of these disorders. 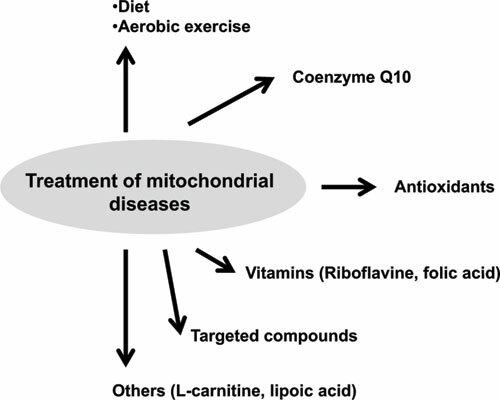 Conclusions: Currently, there is not a fully effective treatment, however, it was demonstrated that the use of some vitamins, amino acids, antioxidants along with a proper diet and exercise have an important effect that leads to improve the overall state of patients with mitochondrial disorders. Mitochondria, diseases, reactive oxygen species, mitochondrial drugs, pharmacological approaches, vitamins, antioxidants.